This is a beautiful example of an old Kyoto Yuzen dyeing. 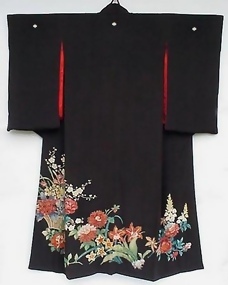 In this kimono, you can see the white lines around the designs, the very characteristic of Yuzen dye. This is where the rice paste is used to resist the dye and is later washed off. The dye on the silk bleeds. By outlining or covering the design area with the paste, the dye artists can work with the design more freely in detail than in the older pre-Yuzen method, which simply uses dip dying and/or embroidery. This is the revolutionary technique that was established in the 1700s by a fan painter. This kimono is done in rare quality work. The embroideries and gold leaves are the eloquent additions to this beautiful dye. It is in the excellent to new condition with some color loss in the original black. The colors in the design area are still vibrant and lined with red gauze silk.